One of the first Oprah Winfrey episode that I watched was a show where she interviewed author and life coach, Cheryl Richardson. Cheryl’s spirited interaction with a troubled guest fascinated me and prompted me to rush to the nearest bookstore to buy her book. This was an early indication of my growing interest in human behavior and using that knowledge to empower others. However, it wasn’t until I was in my mid-20s after finishing grad school, did I seriously consider a career in personal development. By that time my interest had evolved into a full blown love affair of devouring the major self help books on the shelf and attending related workshops and retreats around the world. At that point, I could not disregard the fact that it was one of my strongest passions and a huge clue as to how I could contribute to the world. I decided that I was going to use whatever knowledge and truths that I had learned, until that point, to help others. Within a couple of years I received my life coaching certifications and began seeing clients at a holistic center. Even though I had a steady flow of clients, a lot of the people around me thought that my coaching practice would not go beyond a hobby. A family member called it a “bunch of crap”, the guy I was seeing at the time dismissed any discussions about it whenever I brought it up, and some friends laughed and said that I was way too young to be doing this. The lack of support that I faced fueled my inner critic and severely affected my confidence in my budding abilities. It became harder for me to “sell” myself to others and therefore undermined my marketing efforts. This resulted in a decrease in the number of clients and workshop attendees in my practice. My dream of becoming a successful coach was slowly slipping out of my grip. I reached a critical point where I decided that I had to do something about this decline so I hired a career coach. Over a span of few months during our sessions, we were intensely focused on restoring my faith in my skills and creating a plan of action to push forward with my dream. After a lot of soul searching, I gradually regained my confidence. Here’s what this experience taught me: You have to find a way to believe in your dreams even if no one else does. Don’t ever give up because of what other people say, and always surround yourself with people who can offer you genuine support you when times get tough. Your critics can never know your true abilities, your hearts desires and what you are capable of achieving. Also keep in mind that whenever they vilify your efforts, there is a very good chance that they are projecting their insecurities onto you or feel threatened by your ambitious streak. If you are in a place in your life where you are trying to realize a dream– I encourage you to push forward, even if the people around you think that you are crazy. 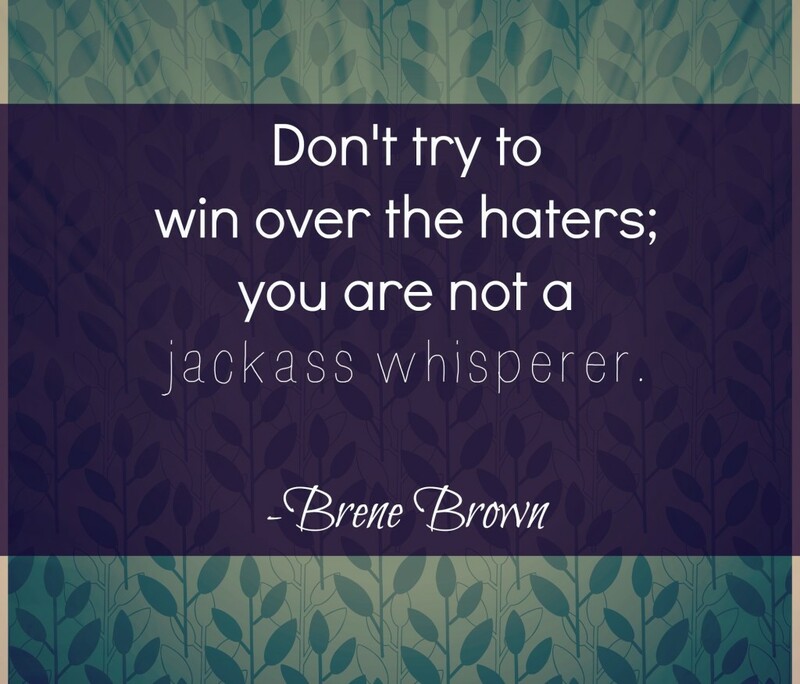 Ignore the haters and the naysayers. I understand that it can be a hard and lonely road filled with temptations of “easier” alternatives. It takes a strong heart and steady mind to push against the current of “sameness” and mediocrity in the world. But you were born to stand out and be unique and sometimes cultivating, that does require courage, risk and sacrifice on your behalf. Remember that history is filled with geniuses and pioneers who faced a lot of ridicule and opposition in their quest for greatness and making the world a better place. 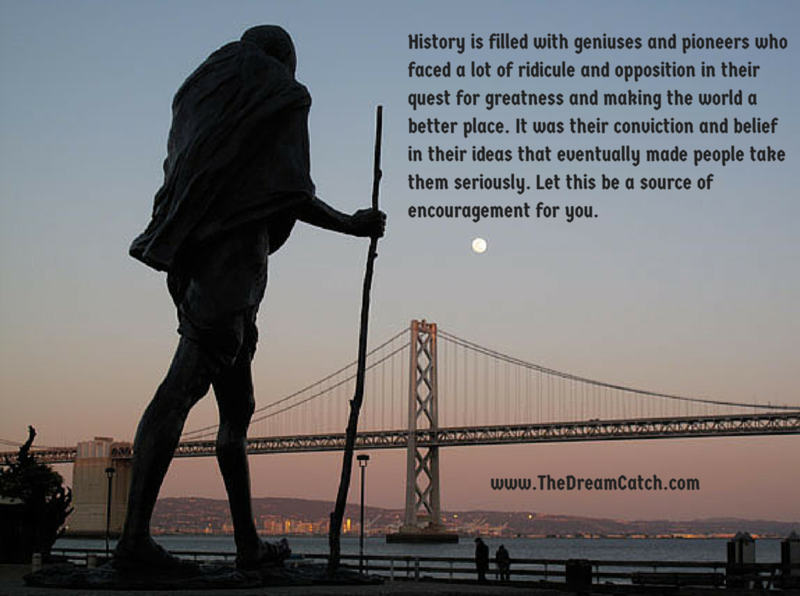 Think about innovators like Einstein and Steve Jobs, or political heroes such Gandhi or Mandela. It was their conviction and belief in their ideas that eventually made people take them seriously. Let this be a source of encouragement for you. If you sense any kind of opposition or lack of understanding from them, stop sharing any details about what you are working towards with them. They will only make you lose faith and breed negativity within you. If you don’t have someone in your immediate circle of friends and family who can be a source of encouragement, try to find someone outside, such as a mentor, coach, counselor, guide, etc. You could even join an organization or group of like-minded people who are pursuing the same thing that you are. It is essential to find a group or a “tribe” that can support you. They are essentially a team of “believers” who see your potential and will stand by your side as you make your way towards realizing your potential. Cherish and protect your dreams! Manifest it into your reality with the support of your well-wishers. Question for you: Do you allow what other people think to prevent you from pursuing a dream? What kind of people do you need around you to feel supported and to believe in yourself? Wow that article really helped me ! great work ! thank you very much !